This archipelago of 700 islands and cays offers azure waters and bright white beaches. As if exploring the islands and cays weren’t enough to keep you busy, the water parks, world-class golf, high-end shopping, sailing and deserted beaches certainly will. Once a haven for pirates, smugglers and rum-runners, the Bahamas is now notorious for being a tax haven and film location for James Bond films. Marine life is prolific, the beaches are powdery-soft, island-hopping is easy and you can even meet the swimming pigs on Pig Beach. 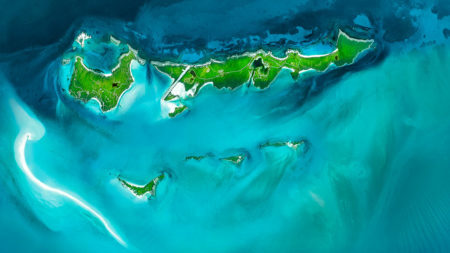 The Bahamas has warm temperatures year round. May to October has higher rainfall than the rest of the year. June to November is the hurricane season throughout the Caribbean. The luxurious One&Only Ocean Club is an indulgent choice for those most discerning of travellers and Paradise Island also hosts a golf course and a casino. For Bond lovers, James visited this resort in the remake of Casino Royale starring Daniel Craig. The Bahamas is perhaps the shark diving capital of the world.